The Château de la Motte Fénelon three-star hotel has 37 rooms offering different levels of comfort and allowing guests to book luxury stays at affordable prices. Close to Cambrai town centre and train station in the North of France, the hotel is open for business 24 hours a day, 7 days a week and 365 days a year. A receptionist is always on duty to facilitate the booking process. The hotel has four Prestige Suites, which are ideal for amorous weekends or your wedding night. These comfortable rooms, some of which feature four-poster beds and spa baths, are ideal for romantic breaks. Six Luxury Rooms, including twin and connecting rooms, also offer high-quality accommodation. And don’t forget our gift packs: here! 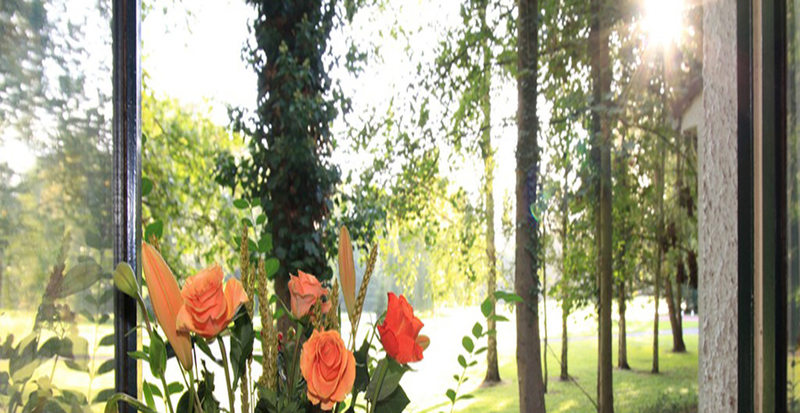 The eight Charming Rooms in the “Orangerie” are ideal for corporate overnight stays and family weekends. These 19 rooms, resembling small cottages nestling under ancient trees in the Château’s eight hectares of grounds, will tempt you with their simplicity and very affordable prices (from €62 to €65 per night depending on the season). Situated 200 metres away from the Château and with a separate car park, they are the ideal way to savour the privacy and tranquillity of nature. To discover our prices and photos of each category of rooms, please click here. All our rooms are equipped with a bathtub or shower, toilet, and flat-screen TV with satellite/Canal + channels in addition to a minibar and telephone. Wi-Fi access is free (Château and Orangerie rooms). For guaranteed relaxation, why not book your massage at the reception desk (Phone: 03 27 83 61 38) (€20 for 20 min. of Amma and €50 for 30 min. of Shiatsu futon massage). The idyllic setting of the Château, its reception rooms and grounds are naturally propitious to relaxation. 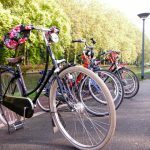 NEW : Discover Cambrai on a bicycle ! 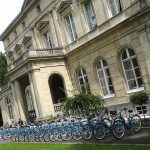 With your family, your friends or collegues, discover the castle and the city of Cambrai during a bike ride. 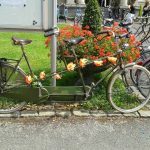 On a bicycle or a tandem, giggles and happy memories are garanteed. Only for the hotel guests. Available from the 11th August 2014. Price List & Informations by Phone 03 27 83 61 38 or per e-mail contact@cambrai-chateau-motte-fenelon.com. If you’re in business, ask us for details of our specially tailored corporate pricing scheme or our overnight stays. 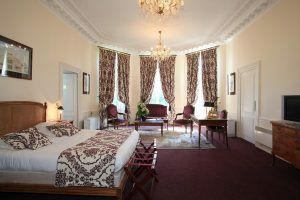 Many locally based companies like to rest easy in the knowledge that their VIP customers or colleagues are properly accommodated in our hotel. We offer attentive service with lots of optional ways to make their stays even more special. We can also organise your corporate events and seminars: Click here. Our gourmet restaurant – Le 109 – is the ideal venue for splendid evenings and weekends. Discover our prices: here. To discover and benefit from our special offers and exclusive promotions, log onto our Facebook Fan Page. For gift ideas, take a look at our Gift packs!